The Reuter-Schwarz Opus 2 in Mattoon, Illinois at Trinity Episcopal Church received a new Great 4’ Octave of specially-fabricated linen lead, scaled and voiced to tonally match the rest of the instrument. Concord University in Athens West Virginia, had the moveable console of their 1968 Casavant Opus 3002 in the main auditorium rebuilt, including a new multiplex relay. Because of masonry repairs following water damage in the wall behind the Swell division, at Evanston’s St. Luke Episcopal Church, we removed and carefully stored the Swell pipework and covered the chests of that division, in order for the repairs to be completed. Following the masonry repairs, the pipework was reinstalled, tuned, and regulated. All of the pipework had to be hand carried down and up a 35’ ladder! This is part of our ongoing curatorship of their famous 1922 E. M. Skinner pipe organ, Opus 322. The Hinners & Albertsen organ at St. Mark’s Catholic Church in Peoria retains its original, stunning stenciled façade! We thoroughly cleaned the organ and releathered the tubular-pneumatic pedal actions. The pedal touch box had an inherent flaw which limited its effectiveness. Buzard designed and fabricated a new touch box to improve the original design and make the action responsive. Second Presbyterian Church in Lexington, Kentucky had both their E. M. Skinner Choir and Swell “Whiffletree” expression engines re-leathered. DePauw University’s Schlicker Practice Organ: received a new Solid-state relay and other repairs following water damage due to flooding. As part of a comprehensive renovation of Smith recital hall at the University of Illinois in Champaign, Buzard was engaged to cover and seal the expressive divisions, remove the pipework and store in pipe trays the Great and Positiv divisions, and further cover and seal the Great and Positiv chests,. The console and pedalboard were completely removed from the hall and were stored at the Service Department warehouse at Buzard. 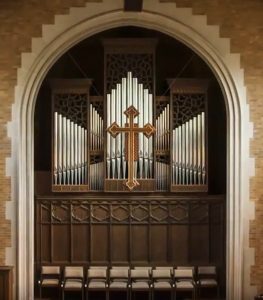 The console at First Presbyterian Church, Fairbury, Illinois occasioned a full rebuild, including stop controls, a new ICS system, and thorough rewiring to a new relay for their Wicks pipe organ. As part of the ongoing care of the turn-of-the 20th-century (ca. 1907) Möller pipe organ at River Forest United Methodist Church, in River Forest, Illinois, the static reservoir was removed, releathered and reinstalled. Lanark United Methodist Church, in Lanark, IL. commissioned Buzard to restore the static reservoir on their Hinners pipe organ. The large Schantz pipe organ at St. Catherine of Sienna Catholic Church, Cincinnati OH, previously tonally re-engineered by Buzard had its pouch boards re-gasketed. Further, the static regulator was recovered. Plaster dust and broken trackers were cleaned and repaired at St Mary’s Catholic Church in Canton, IL on a lovely two manual Hinners mechanical action organ. St. John United Methodist Church, Atlanta, Georgia received tonal re-engineering, rescaling and revoicing of the flues in their Schantz organ, as well as the addition of a new Pedal Subbass. The console was rebuilt with new manuals, stop controls, relay, and combination action. Fund-raising is ongoing to replace the reeds to complete the project. University Place Christian Church, Disciples of Christ in Champaign, Illinois boasts the largest pipe organ in the city, a 1957/1963 Reuter. We were commissioned to re-leather the Great pouchboards of the instrument as part of our ongoing restoration of the organ. St. John Lutheran Church in Danforth, Illinois continues to maintain its Wicks pipe organ. After a complete upgrade of the console in the previous year, we continued the process by releathering of the stopped flutes and restoration of the Harp action. Tremont Baptist Church, Tremont, Illinois had the organ console of its 1940’s Schantz removed during a renovation, and then relocated and reinstalled with a longer cable. After water damage to the ceiling and wall in the Swell, we releathered and reinstalled pouch boards in First Federated Church, Peoria’s 1977 Schantz. Emmanuel Memorial Episcopal Church in Champaign, Illinois had Buzard undertake repairs to its Schlicker organ, including rebushing of the Pedalboard, revoicing and repair to Swell reed stops, and replacement of pull-down magnets in the Pedal slider chest. St Joseph Catholic Church, in Delphi, Indiana, had Buzard rebuild the façade and Pedal windchests of its Wangerin organ. At First Christian Church in Bloomington, Illinois, Buzard repacked stoppers and caps in the church’s Schantz organ. The extant chimes, long out of service, at St. John Berchmans Church in Chicago were cleaned and re-hung. The final stage of replacement of Austin note and pedal actions was completed at St. Paul United Church of Christ, in Pekin, Illinois. The stopped flutes at Wesley United Methodist Church in Charleston, Illinois were repacked in the church’s Reuter organ. St John Lutheran Church in Anchor, Illinois had a blower box enclosure fabricated by the Buzard team to minimize the noise of the static blower. A second “helper” blower was added to increase the reliability of the early 20th century Hinners ventil windchests. North Shore Baptist Church’s Austin in Chicago had their stoppers releathered and the tapered flues, chimneys and canisters shimmed. All the reeds at St. John’s Lutheran Church in Buckley, Illinois were thoroughly cleaned in the church’s Moller organ. Finally, a Wangerin pipe organ in Bonfield IL that has served Zion Lutheran Church for decades, simply needed a careful cleaning. All of this work, in additions to over 250 contract, and on-call tunings of the many instruments we maintain, constitutes the majority of our work alongside our main projects for the year, the relocation and refurbishment of Bethlehem Lutheran Church in Hortonville, Wisconsin, the installation of a rebuilt Möller Artiste at St. Paul Lutheran Church, Brimfield, Illinois, the completion of St. Mark Lutheran Church in Watertown, Wisconsin, and the rebuilding of the organ at Plymouth Congregational U.C.C. Church in Milwaukee, Wisconsin.